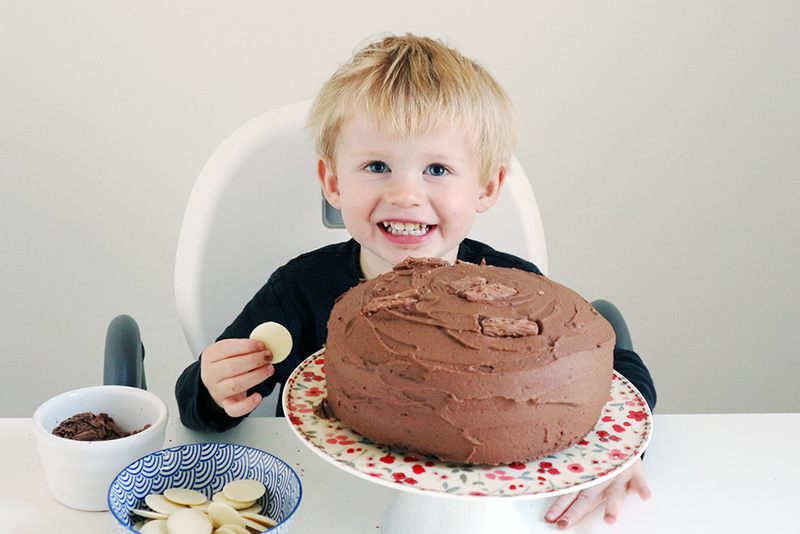 Zach definitely takes after his mama, with a sweet tooth and a love of baking. It's a hobby that I'm keen to encourage, and one that I hope he will enjoy for years to come, although of course I don't intend to let him gorge his way through huge slices of cake every day. I've actually put together a list of recipes I'd like to try with him, and from now on we will pick one each week, and spend an afternoon getting our bake on. 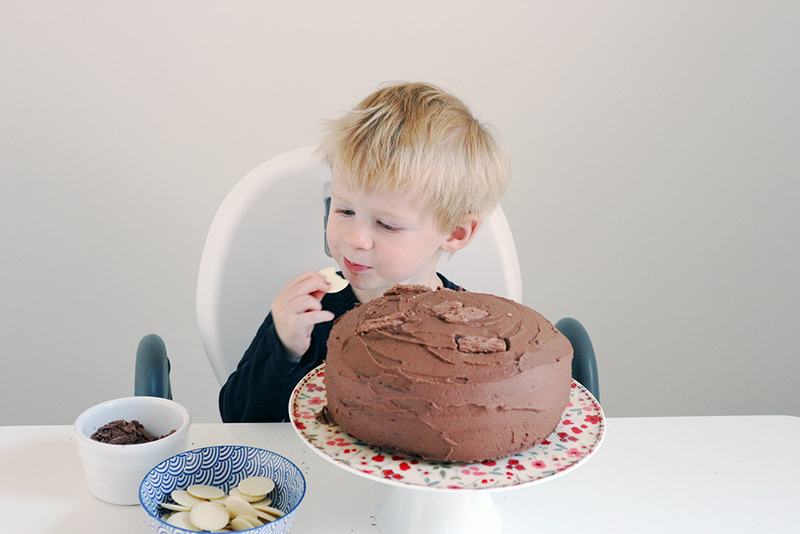 This week I asked him what he'd like to make, and he asked for a chocolate cake so nicely that I couldn't refuse - especially as it's one of my all time favourites! 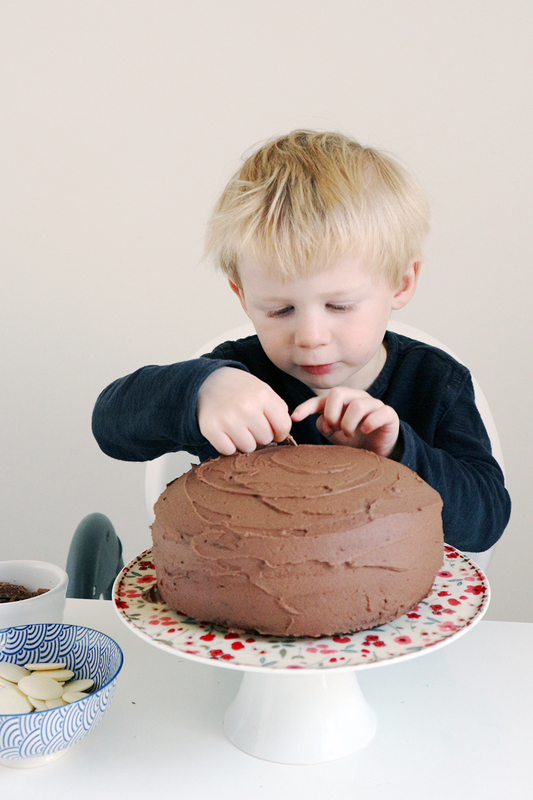 We quickly whipped one up using our favourite chocolate cake recipe, and then I let him decorate it too. We kept it simple, which all of our bakes will be, and it turned out great. A light and moist sponge, with a rich and irresistible buttercream - what could be better? I've shared the recipe below, in case you want to give it a go yourself, which I definitely recommend you do! 1. Preheat the oven to 180ºC/Gas Mark 4, grease and line the two cake tins. 2. Sieve the flour, cocoa and bicarbonate of soda into a bowl, add the sugar and mix well. 3. Make a well in the centre, and add the syrup, eggs, oil and milk. Beat well with an electric whisk until smooth. 4. Spoon into the tins, and bake for 25-30 mins until risen and firm to the touch. Remove from the oven and leave to cool before turning out onto a cooling rack. 5. To make the buttercream, beat the butter until soft. Gradually sift and beat in the icing sugar and cocoa powder before adding enough milk to make the icing fluffy and spreadable. 6. If you want to make a the cake a little neater, use a serrated knife to cut off the top of the cakes to make them flat. Sandwich the two cakes together with the buttercream, and use the rest to cover the top and sides. To decorate we used white chocolate buttons and two crumbled flake bars, but of course you can use anything, or leave it plain. We've shipped off a chunk of the cake to my mum, and will probably spend the next few days eating our way through the rest! Let me know if you try the recipe, and if you have any recipes that you love and can recommend please pop them in the comments below!